Born Darrion Montay Willis, Teacher Dee is living the American dream. 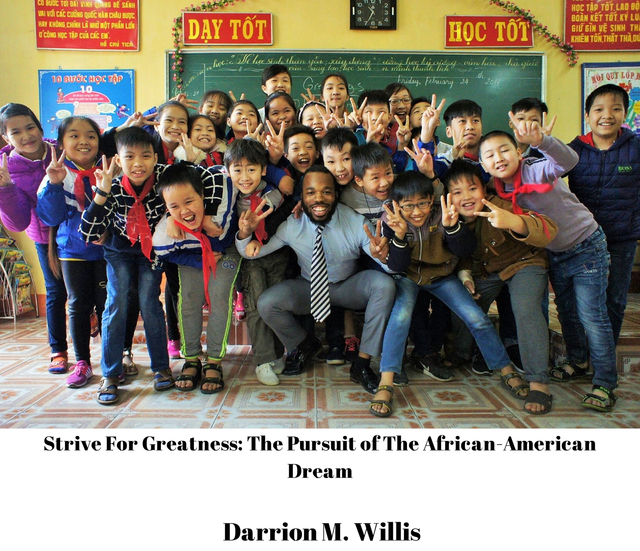 World traveler, teacher, and now author, he has permanently devoted his time to teaching children around the world while discovering the true meaning of life; life as an African-American man. Growing up in Southeast Washington, D.C., Teacher Dee has been able to defy the odds. He's earned a scholarship to attend and graduate from the University of Vermont (2013) and now a graduate student at Harvard Extension School. He has already been to Vietnam, Cambodia, Hong Kong, Laos, and Thailand. He is an ambassador of his city and children around world teaching English. He wants every child to have access to quality education. This two part photographic memoir details his entire journey abroad. He's currently living in Ho Chi Minh City, Vietnam. He's a fitness enthusiast and dancer outside of teaching. Teacher Dee will be studying English at Harvard Extension School.